Disney Favorite Character Dining Restaurant? Hello everyone! I hope you all have had a wonderful Thanksgiving holiday, and are tackling your leftovers with gusto! 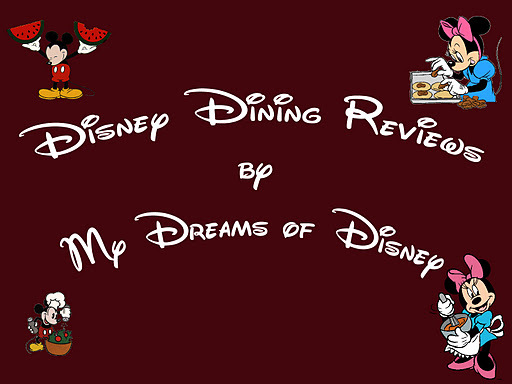 Since much of America was focused on dining this past week, I thought it would be fun to explore the different dining options at Walt Disney World to try and figure out what my favorite is — and for you to figure out what your favorite is also! So, without further ado, let’s get cracking on it! *Liberty Tree Tavern used to be a character dining restaurant — but isn’t anymore. In order for me to determine my favorite — if I can, I might add, I fall back to some of the pictures I have of the dining experiences we’ve had at the restaurant, so let’s take a look at each of these with a favorite picture. 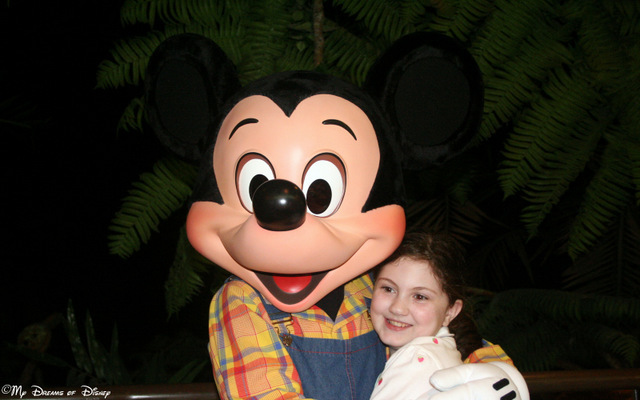 The look on Sophie’s face is priceless in this trip to Chef Mickey’s in 2007! We’ve eaten at Chef Mickey’s twice — this time in 2007 for dinner, and in 2012 for breakfast. 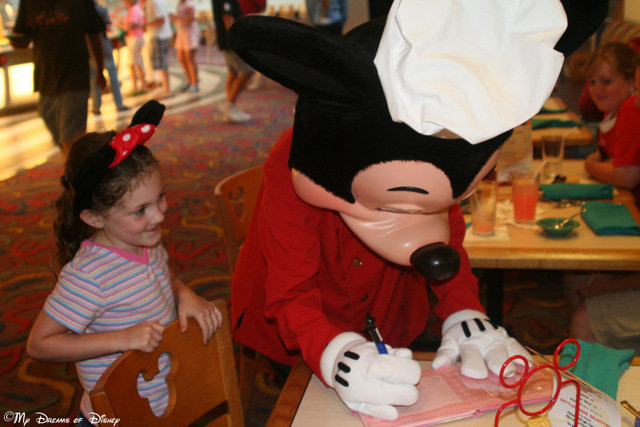 I totally think that breakfast is a better time to eat here, but I’ve got to say, when I came across this picture of Sophie watching Mickey sign her autograph book, the look on her face said it all. That look of adoration towards Mickey is just priceless! 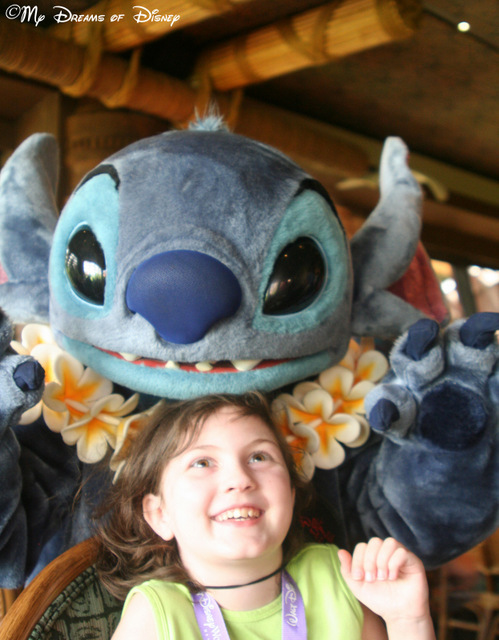 Sophie is pleasantly surprised by Stitch at ‘Ohana Best Friends Breakfast! We have eaten at ‘Ohana just one time — but it was a lot of fun! We had breakfast there in August 2009, and we traveled to the Polynesian Resort by way of Water Taxi from the Magic Kingdom, and loved our trip over. The food was incredible, Lilo and Stitch were fun, as were Mickey and Pluto, where were there that day, and we will definitely eat there again! 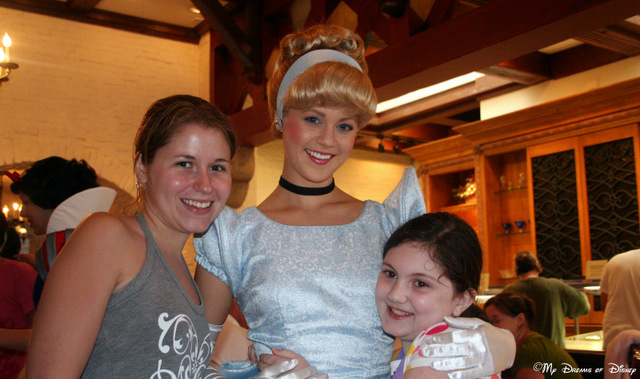 Sophie poses with Cinderella for a picture at 1900 Park Fare! Of all our character dining experiences, probably our least favorite was 1900 Park Fare. Sophie liked meeting Cinderella, and enjoyed seeing her and the Prince dancing, but she most definitely did not like the stepmother and stepsisters! 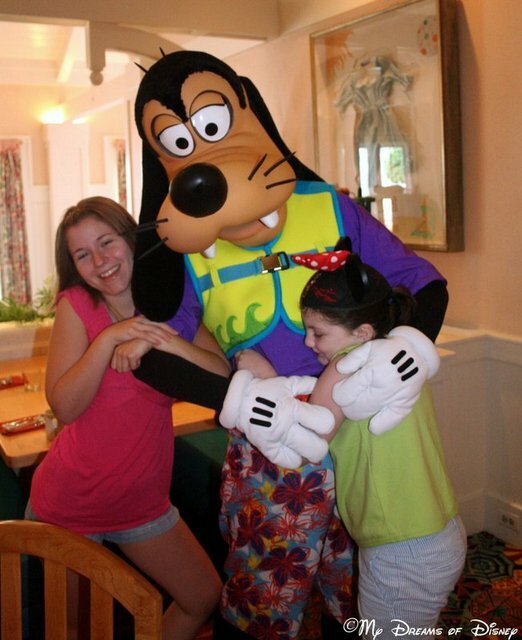 Stephanie and Sophie hugging Goofy at the Cape May Cafe in 2010! Cape May Cafe was another of our character dining restaurants — this time, we went in 2010. We really enjoyed it, with Minnie Mouse, Donald Duck, and Goofy entertaining us! We will definitely eat there again! 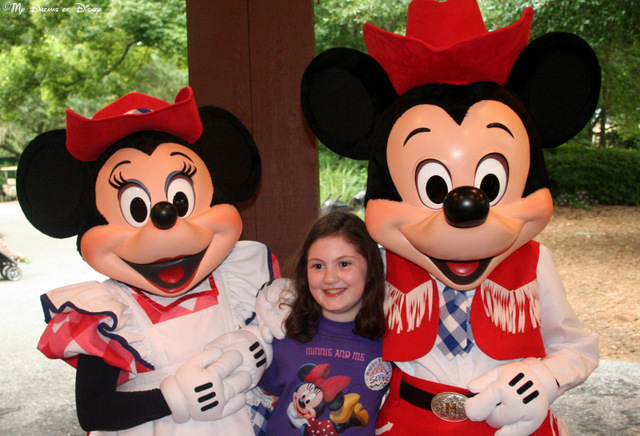 Over at Mickey’s Backyard BBQ, Sophie gets her picture taken with Mickey & Minnie! We ate at Mickey’s Backyard BBQ in 2010. I thought the food was just okay, but I really enjoyed the show and seeing Mickey & Minnie and the other characters all decked out in their western garb! I think next time we need to see about the Hoop Dee Doo Revue! 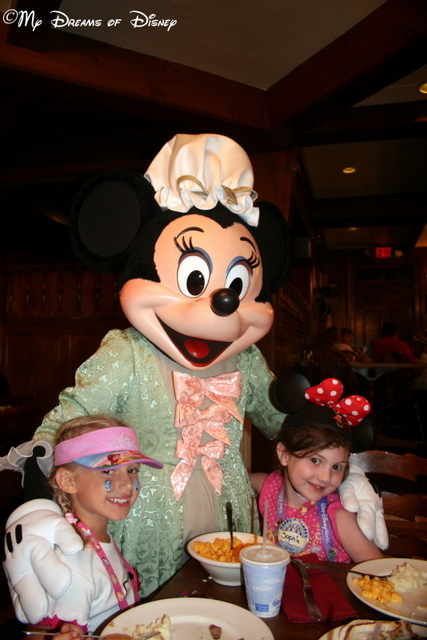 If the Liberty Tree Tavern was still a character dining restaurant, it would probably rank up there right at the top of my list — but it was discontinued as a character dining restaurant not long after we ate there in 2008 for Sophie’s birthday with her best friend Riley. 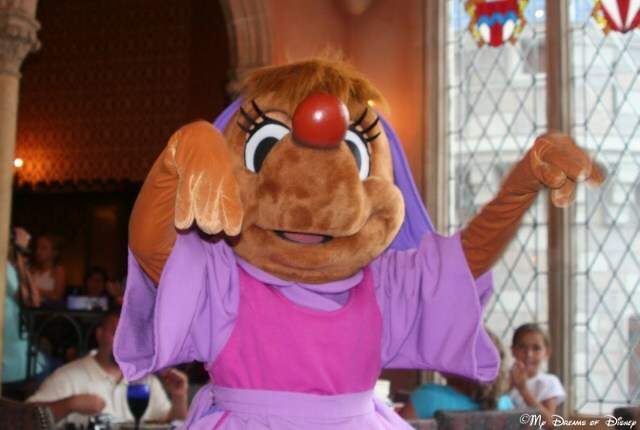 I loved the period clothing, and love the food too, but miss that it isn’t a character dining restaurant anymore. Sophie at the Crystal Palace, loving on Winnie the Pooh. 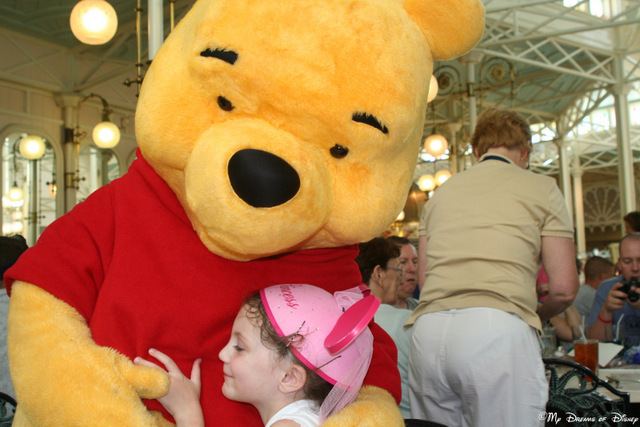 I love this shot of Sophie hugging Winnie the Pooh at the Crystal Palace. We have never been here for breakfast (yet), but I have never had a problem with the food at the buffet for either lunch or dinner. As you can see, this restaurant features the characters of Winnie the Pooh, so you’ll meet Pooh, Piglet, Tigger, and Eeyore when you eat here. This picture was also taken in 2007. 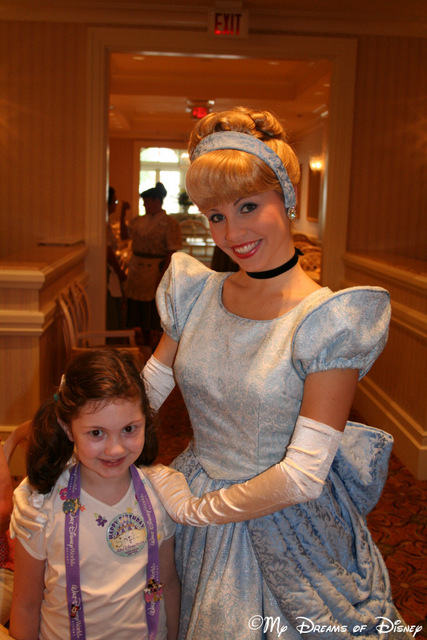 We’ve eaten at Cinderella’s Royal Table a few times, and have enjoyed it. I thought I would share a not often seen photo of Mary from Cinderella. Here are Mickey and Sophie at the Garden Grill Restaurant! The Garden Grill Restaurant is a great character dining restaurant. Hosted by Chip and Dale, you will often find Mickey and Pluto here too. What makes this restaurant cool is that is spins in a slow moving circle, and you can see the different seasons from the Living with the Land ride below. 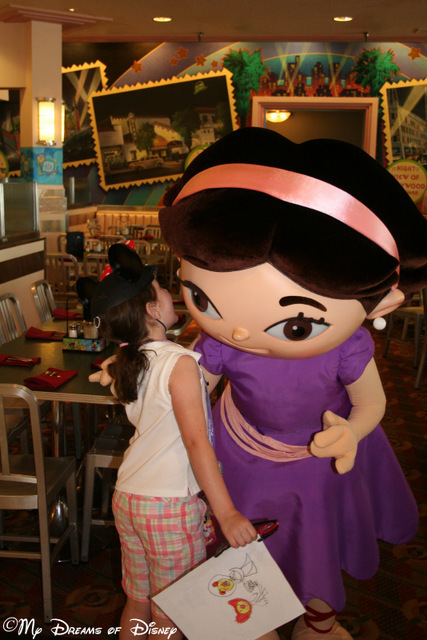 I really enjoy this character dining restaurant! We often visit Princess Storybook Dining, it is such a good location to enjoy great food — and it has Princess appeal that ranks up there with Cinderella’s Royal Table! This one is definitely high on our list of character dining restaurants! The breakfast here is like a normal Disney breakfast, so the food is good. We enjoyed our time here the one time we ate here, but Sophie has outgrown this now, so it’s not one that we have been back to. If you have young ones, I would recommend it once for them — and the characters have been updated to also include Jake, Handy Manny, and Special Agent Oso. So, after all of this, what is my favorite Character Dining restaurant? Well, I think that I have more than one favorite. Truly, it really comes down to the memories for me, so, because of that, almost all of them are favorites because of the different memories that they invoke from the times we ate there. Do you have a favorite? Well, how about picking one from our poll below, and thanks! What is/was your favorite Character Dining Restaurant? Sophie and her Poppy reading a book. Happy Thanksgiving, my friends! I hope that you are waking up to the smells of good food, the laughter of family, and the thankful nature that we all hopefully have at this time of year. Here at My Dreams of Disney, we have so much to be thankful for — not the least of which, of course, is our Lord and Savior Jesus Christ — so I thought I would take a moment to share with you some of the things that I’m thankful for on this blessed day. I hope that you enjoy our photos, and that you and your family have a wonderful day together! The picture at the beginning of this post was taken on Thanksgiving Day, 2008 — in what would be the last Thanksgiving that my Grandpa would come to our house for. In this picture, Sophie and her Poppy were sitting at the dining room table, reading a book — or, to be more precise, Sophie was reading to her Poppy. 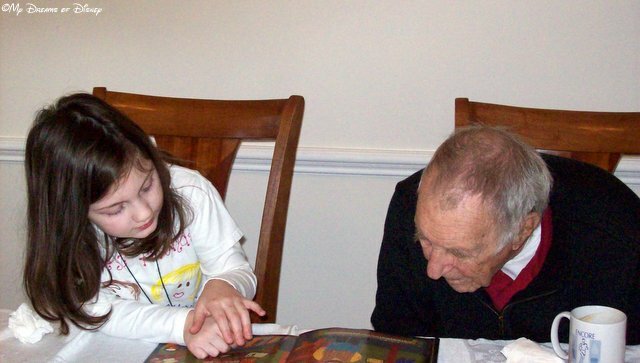 My Grandpa had Macular Degeneration, so his eyesight at this point was pretty bad — but he loved having Sophie there to share the story with him! The time that Sophie was able to spend with her Poppy (and Nana, before she passed away) is definitely one thing that I am truly Thankful for. 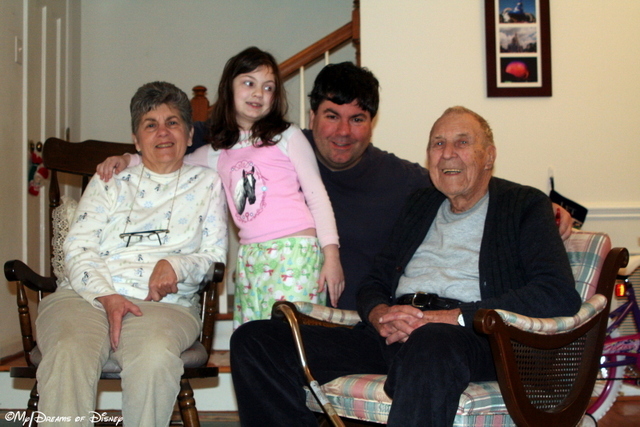 This next picture was taken on Christmas Day in 2008 — in it, you see Sophie, with her Daddy (me), Mom on the left, and Grandpa — four generations, all represented in one photo. The blessings of Family are among my most treasured blessings! 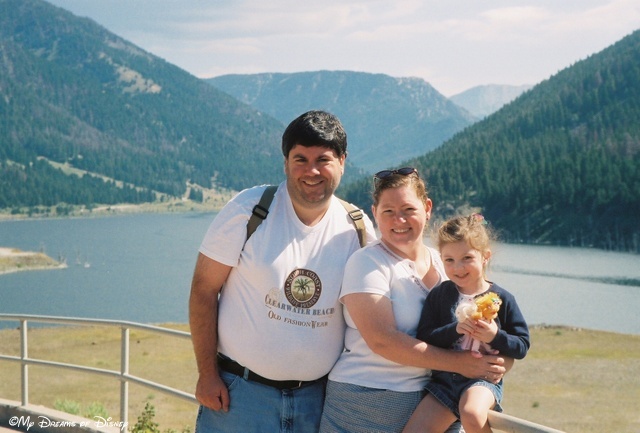 Continuing in my theme, you see another family moment — this one was taken in Montana, at Earthquake Lake, in 2005, when Cindy, Sophie and I went there to visit family and celebrate our 5th wedding anniversary. Cindy, Sophie and myself in front of Earthquake Lake in Montana, August, 2005. Another thing I’m thankful for is my sister Robin and her family. 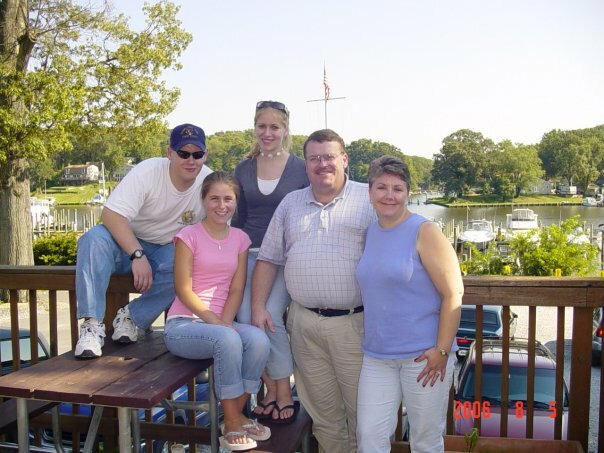 This picture is a little dated, but in it are Jim, Robin, and their three kids, Brett, Leslie, and Stephanie. Robin, Jim, and their kids. I’m also thankful to the newest member of our family — Regan, our lovable Golden Retriever who has made himself right at home. He has a heart of gold, and not a mean bone in his body! 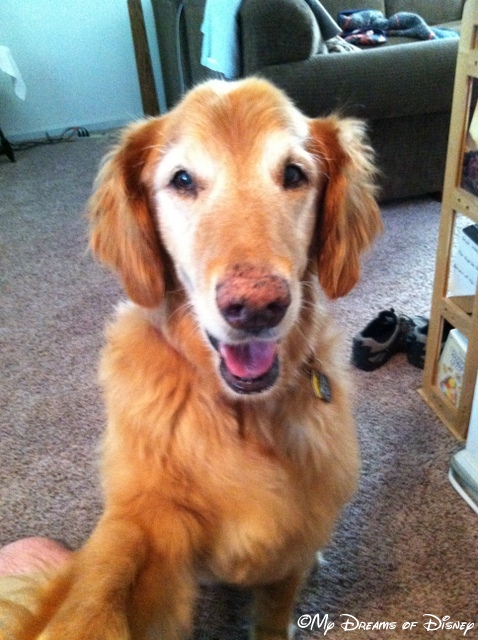 How can you not love this buddy! Of course, no post about what I’m thankful for wouldn’t be complete if I didn’t mention Disney — it is, after all, one thing that I am absolutely blessed to be able to enjoy with my family and our friends! 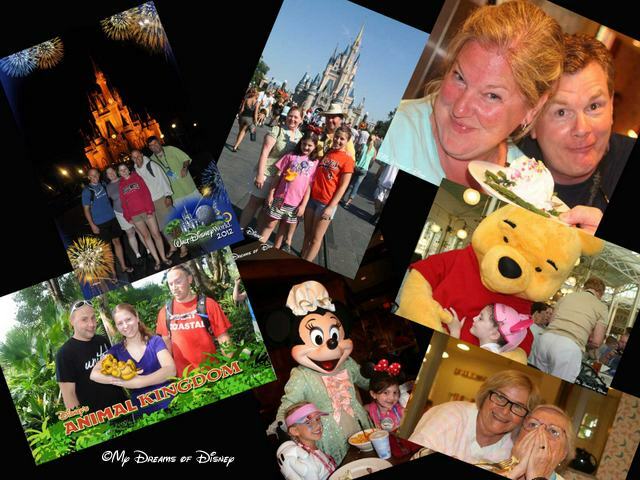 This collage of pictures was just created for this week’s Wordless Wednesday post, but I am thankful for each and every memory that our trips to Disney have created in the hearts and minds of me and my family. Included in collage: Kyle, Cindy, Steph, Shane, Sophie, Nancy, Otis, Riley, Minnie Mouse, Pooh, Mama, Sherry, and me! 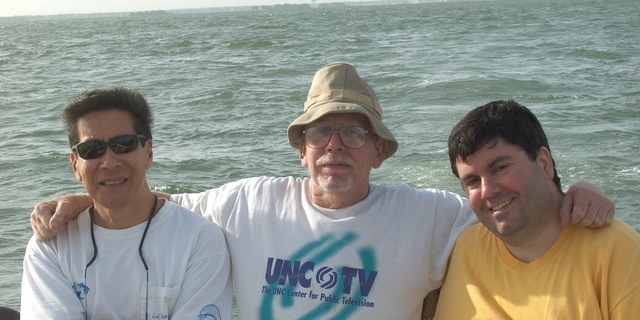 To finish us off, I want to share one last photo — a picture of my Dad, his buddy in Florida, and myself, taken on a boat in the Gulf of Mexico. I didn’t catch a single fish that day, but it is a memory that I have never forgotten, and one that I truly am thankful for! My friends, I hope that this day finds you with a thankful heart as you celebrate as best you can Thanksgiving. I know that the world is not perfect — I know that many of you have to work on this day because of the greed of selfishness of business owners, and I know that many of you may not have family around to celebrate with. Please know that those of you that take the time each and every day to stop by our little site to hear what we write about — whether it be about Disney, our Lord, or anything in between — please know that YOU are also part of my family, and I am blessed beyond belief that you come and visit. Please be safe, everyone, and no matter what the circumstances may be, please have a Happy Thanksgiving. Belk. Macy’s. Kohl’s. Best Buy. Kmart. Sears. Target. Walmart. Toys ‘R’ Us. 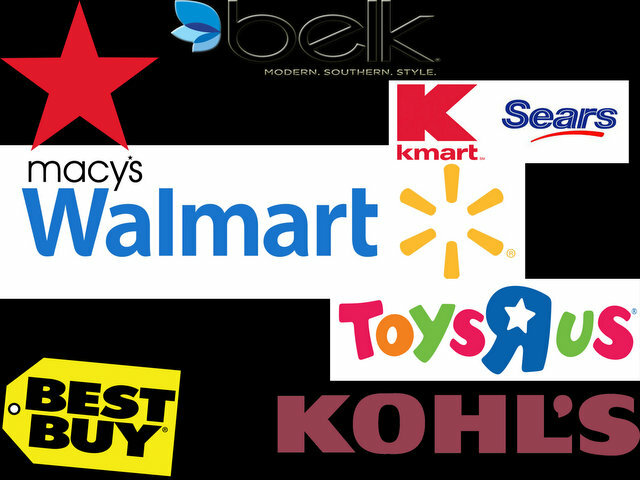 These are just a handful of stores that have announced that they will be opening on Thanksgiving Day. What has happened to our society? Where has our sense of family gone? Why have we become a society that cares only about ourselves, and never stands up and says enough is enough? For years, Black Friday was the traditional start of the Christmas Season — the one day in the year when retailers around the country would open up early, stay open late, and provide incentives in the form of sales for top notch stuff to entice consumers — like you and I — to wake up early to be part of the game. Black Friday was also the supposed day of the year when retailers would actually turn a profit for the year — when their months and months of low sales and high overhead would be reversed on one day of shopping. Hence the term Black Friday. Somehow, though, all that has changed. Gone are the days, it seems, when Thanksgiving was about spending time with your family — when you would sit home, enjoy a great meal, talk around the table about the blessings that you have, and generally, love your family and spend time with them. Now, we are so impatient, so quick to want to move on to the next thing — whatever it may be — that we are bound and determined that we will allow ourselves to be taken away from our families by the promise of a great sale for some piece of rubbish that we don’t even need. I wish that we were transformed back to a simpler day and age, a time when stores weren’t open on major holidays — in fact, they weren’t even open on Sunday. A day when we ate a meal together every day of the week, not just on Thanksgiving — and we counted the fact that we had food on the table as one of our many blessings. I miss those days. It wasn’t that long ago when our society would rise up and be a force — when the shopping public would announce loud and clear to the retail chains of this country that we were not going to be shopping at your stores on Thanksgiving, so don’t ruin the day for your employees by opening. In fact, don’t even think about it. 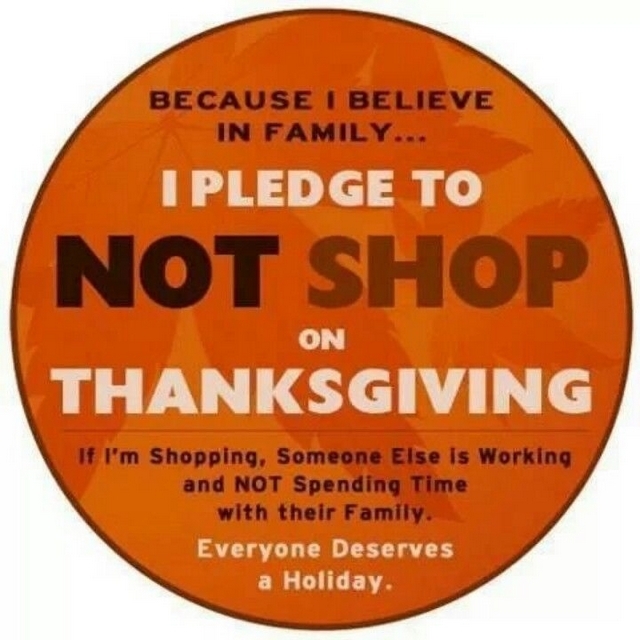 Now, we don’t care that we are taking away from someone elses Thanksgiving time from their family — all we care about is getting out there at 4PM to get a ticket to get in at 6PM, or getting to the mall at 7PM so that we can get a lousy $5 gift card when the store opens at 8PM. I wish that the insanity would stop, that people would realize that they are being foolish beyond belief, and that, just once, we as a society wouldn’t allow ourselves to be herded like cattle just because some stores are opening on Thanksgiving. I will not be shopping on Thanksgiving, I will not be shopping on Black Friday — the only shopping I may do is to support my local retailer on Small Business Saturday — and I’m not even certain that I’ll do that. I urge you to do the same. Today I’ve got a special assignment — my friend Hayden asked if I could help her with a technical difficulty she is having, and to get an accurate idea of what is going on, I’ve got a guest post up on her site! Come visit me and read about one of my all time favorite Disney Memories, when we had a chance encounter with Princess Jasmine and the Genie in the Moroccan Pavilion at Epcot’s World Showcase! So, please check out My Favorite Disney Memory — over at Disney with Babies, Toddlers, and Preschoolers! While I have told this story before on this site, it lends itself for a retelling because it focuses on one of the things that really makes Disney, Disney — the uncanny ability they have to create a Disney Memory out of nothing! Hayden, the offer is always open if you want to write a guest post here — just let me know, and thanks for having me! Hello everyone, and welcome to this week’s Wordless Wednesday post! This week we are taking a look at the Disney theme “Friends and Family” that my good friend Deb from Focused on the Magic posts on her site, and with Thanksgiving just a short ways away, this is the perfect theme! I’m trying to get a little fancy here, so I’m creating a picture out of some of our pictures from the past few years — do you like it? I’m not sure that I have that creative gene in place to do this sort of stuff, but we’ll see! As always, please stop by Focused on the Magic and check out the rest of the great entries! This is a happening hop because of all the hard work that Deb has put into it, and if you have a blog and want to share a Disney photo with us, please write up a post and add it to the link! Just click on the button below to get to Deb’s site, and thanks for stopping by!